Fix OneDrive sync problems Sync errors can occur for several reasons with OneDrive for Business. Many errors can be fixed by using the Repair option in the OneDrive for Business menu that you can see from the taskbar notification area. 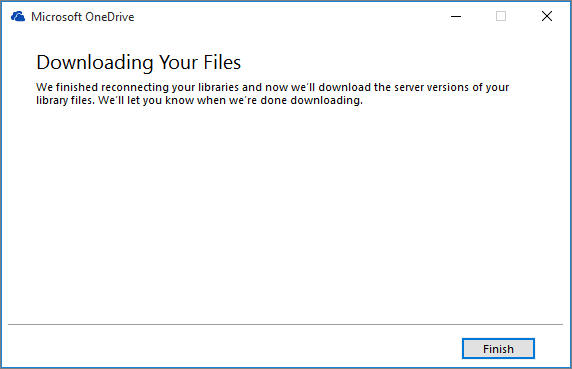 This article covers sync using the longtime OneDrive for Business sync client, not the new OneDrive sync client. 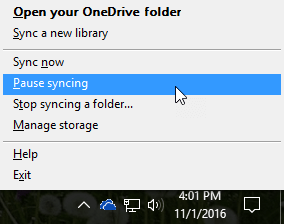 Which OneDrive sync client am I using? Get started by right-clicking the OneDrive for Business menu icon in the taskbar notification area, and then clicking View sync problems. In either case, you can run Repair instead of trying to fix each sync error one at a time. 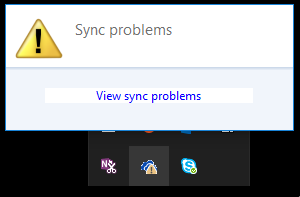 Note: There are many reasons why sync might fail. If this method doesn't fix the problem, check out the links in the Still having sync issues? section of this article. In the taskbar notification area, right-click or press and hold the OneDrive for Business menu icon , and then click Repair. In the dialog box, click Repair. Repair reports your progress until all sync connections are reset. Important: Don’t restart your computer while Repair is running. If you have a timed auto-restart scheduled for your computer, postpone it until you’re sure Repair is finished. What happens when you run Repair? If you change where your synced folders are stored, the archive folder may be called \OneDrive for Business -- Unsynced Changes\ when viewed in Explorer. At a CMD or DOS prompt, the folder is called ODBA. In that folder, OneDrive for Business creates subfolders with the current date and time as the folder name, such as \2016-02-16 15-03-09\ to store files that can't be synced. When Repair runs, it syncs the folder with the files that aren't causing the problems, and moves the other files into the archive. Repair creates these archive copies in case you had updates that couldn’t be synced to the server before you started Repair. This ensures that you don’t lose any local updates. You can compare file versions in the archive library folder with the reconnected folder to make sure you have the version you want. When you're done with repair, the notification icon that signals sync problems should be clear. 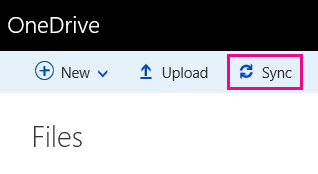 If it's not, click the OneDrive for Business notification icon , click View sync problems. If there are no more issues to fix, click Dismiss in the OneDrive for Business dialog box. Why don’t I see the Repair command? The Repair command appears in the OneDrive for Business menu only if you're experiencing sync errors. 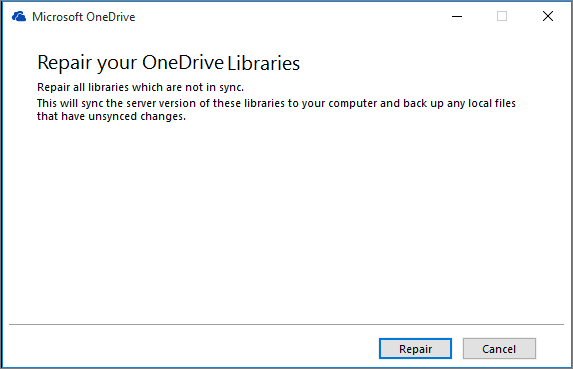 If you're experiencing sync errors but you still don’t see the Repair command, you might need to update the OneDrive for Business sync app. For more help troubleshooting the old OneDrive for Business sync client, see Fix OneDrive for Business sync problems. 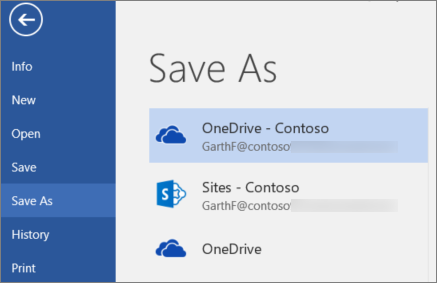 See Update the OneDrive for Business sync app for the latest desktop app. 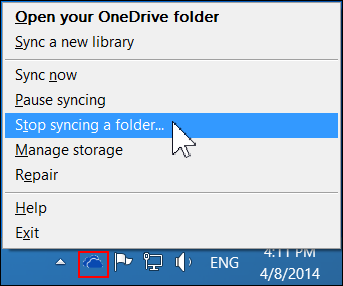 See Sync files with the OneDrive sync client in Windows for the correct way to set up OneDrive for Business and sync. Sometimes it's better to stop and reestablish the sync connection again. See the following procedures to stop and restart syncing your library. Before you can repair a sync issue, you need to stop syncing all folders. When you stop syncing a folder, the folder is disconnected from its library. All files are retained in the previously synced folder. You can sync the library to your computer again at any time. When you start syncing a library again, it will create a new folder on your computer. If it's using the same name, it will add a number to the end, such as 1, 2, and so on. Note: If the OneDrive for Business icon isn't visible, click the Show hidden icons button in the notification tray. Select the folder you want to stop syncing, and then click Stop syncing. Click Yes to agree to permanently stop syncing the folder, and then click OK.
You can start syncing your library again. When you start syncing a library again, it will create a new folder on your computer. If it's using the same name, it will add a number to the end, such as 1, 2, and so on. Sign in to Office 365 or your organization's SharePoint site with your work or school account. 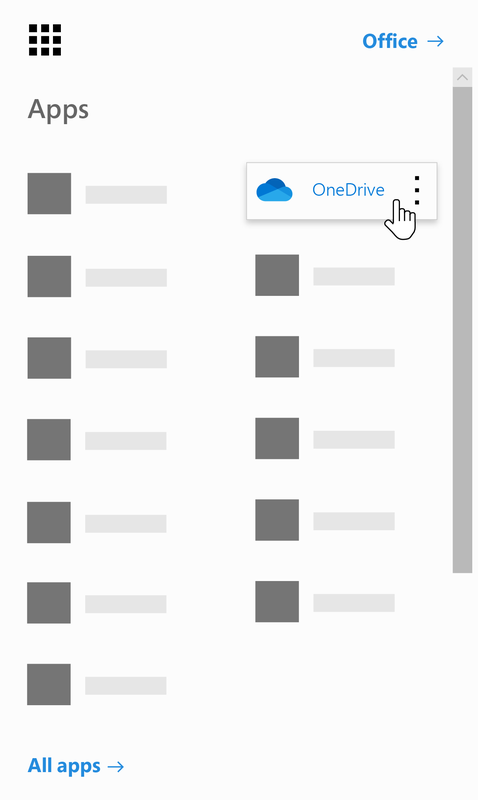 Select OneDrive at the top of the page. Or, select the app launcher , and then select OneDrive. At the prompt, click Sync Now to start the sync app wizard. The wizard automatically fills in the name and web address of your OneDrive. Select Sync Now in the wizard to start syncing. 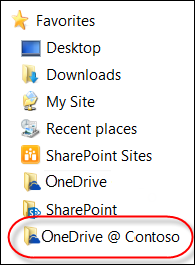 You can click Show my files… in the wizard to open your OneDrive folder in File Explorer. 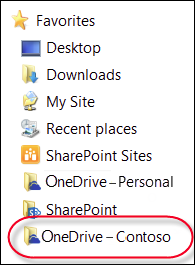 The folder is listed in your Favorites as either OneDrive - CompanyName or as OneDrive @ CompanyName.